Mark Twain may have called golf, "a good walk spoiled," but he never had a Yamaha R1-powered sand-rail cart, so please forgive him. Now, you can have one too. Just remember to yell "fore!" before launching over the greens. 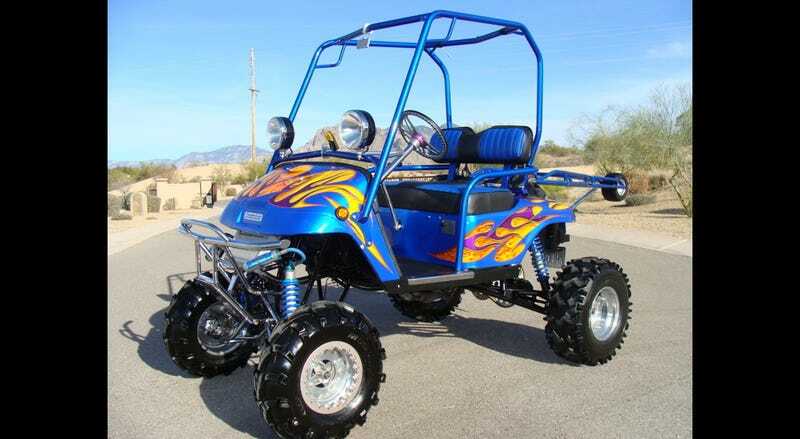 This cart, now for sale on the Eeeb, is one part Ez Go, seven parts chrome, nitrous, wheelie bar, dirt tires, nitrogen-charged coilover racing shocks, custom paint and sportbike engine. In fact, the builder sank $25,000 into this thing so even if you think it's a travesty, ya better show some respect. Use it for the links, or for terrorizing the toe-headed mopes in your planned community.